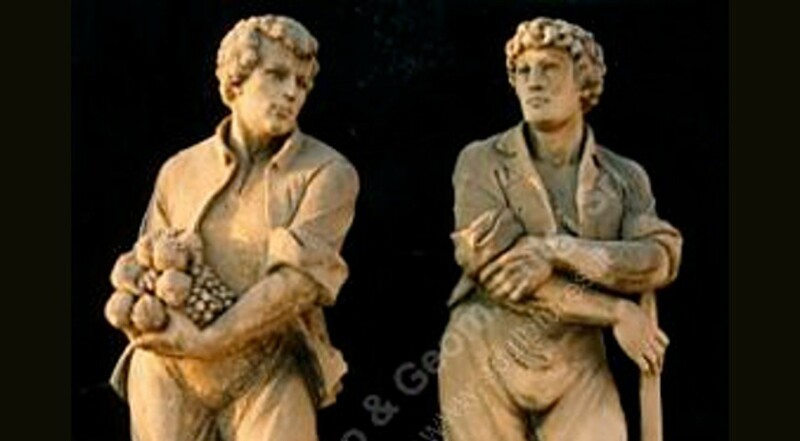 A large set of male four seasons statues carved in Vicenza by our sculptors. Original our design, classic antique origin. A lot of Seasons statues were designed by Andrea Palladio, he used several statues of the Villa's. Around Veneto area, Venice, Vicenza,Treviso and other places all the parks have these type of hand-carved sculptures. Landscape architect and garden designers use today these nice elements on the private Residence parks. This classic style statues are hand carved in our Firm from our sculptors with the antique tradition of "scalpellini". The Marinali school is other important influence for the statues placed on the top of Villa. See the images on the roof of Villa La Rotonda in Vicenza, the particularity of the carved sculptures in Vicenza stone are also all around the large park on the little green hills..